Stonework and thick wood beams give he kitchen an earthy feel. Photo by Tim Murphy. After building several homes in other parts of the U.S., Houston, Texas-based Mark and Monique Boling had decided to buy an existing property when they were looking for a vacation home in Steamboat Springs. Monique Boling's stone sink finds a home in the powder room. Photo by Tim Murphy. That was until they stumbled upon a vacant lot in Elkins Meadows, met Steamboat Architectural Associate’s Bill Rangitsch and talked details with Shively Construction’s John Shively. Plans came together quickly, with local Interior Designer Susie Wilkinson pulling together the softer elements of their shared aspirations for a rustic elegant mountain home. Mark Boling says he and his wife have become great friends with the trio, a testament to each professional’s abilities to manage his or her part of the project. 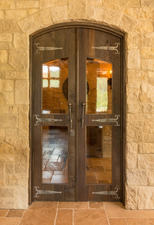 During the building process, Mark Boling was impressed by the attention of the craftsmen. “They gave me faith again that there are people who take pride in their work,” he says. Every aspect of the property manifests their attention to detail. Upon entering the home, it feels unquestionably like a European lodge one might find nestled in the French Alps. 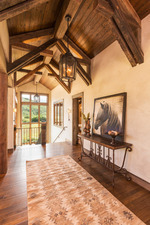 It is hard to pinpoint what draws the eye most: the all-embracing mountain views or the craftsmanship visible in the exposed, reclaimed wood beam ceilings. Expert craftsmanship is on display in the recycled ceiling. Photo by Tim Murphy. Hallways are elongated, ceilings are high, and windows are panoramic. A stone fireplace towers in the open living room, kitchen and dining space, another telltale sign of the meticulous work of human hands. Hickory flooring, muted plaster walls and rich walnut cabinetry emit an earthy ambience, set off by tactically placed LED up lights. Decorative ironwork has been carefully woven into handrails, framing the staircase to the lower level. Two sizeable guest suites sandwich this quintessential entertainment space. 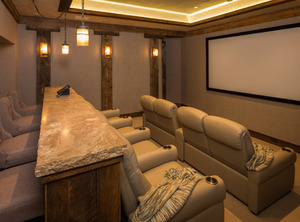 A wine cellar and wet bar flank the eight-person media room complete with a Steinway sound system. Discreetly tucked away from the living space is an extensively furnished workout room. Perhaps the pièce de resistance of any Steamboat Spring’s home is the hot tub, which in the Bolings’ case is below ground, beneath a motorized cover. Custom cabinetry capped by immense granite countertops retains flow between floors. Working with such an abundance of reclaimed wood gave Shively’s team a series of gratifying challenges to overcome. A curiously shaped stone sink, sourced by Monique in the Texas Hill Country, initiated a jigsaw-like puzzle for the cabinetmakers. A laundry room set off from the entryway houses enclosed cubbyholes with doors straddling both sides of the wall, conveniently opening on one side into the master suite closet. A hidden laundry chute sends clothing to the ground level. Conveniently, the top of the chute comes from a secluded two-bedroom, two-bathroom and living room nook, occupied by the Bolings’ youngest two of four sons. While the home is currently used solely for vacations, a move to make this the Bolings’ permanent base is in the cards. Steamboat’s reputation as a community first, ski town second, is luring this Houston family to relocate. Spending time in their Elkins Meadows home is proving addictive. Perhaps it’s the al fresco dinners enjoyed on their magnificent covered deck followed by an hour or two fishing in the nearby pond. Then again, there are those wondrous days on the slopes with an après ski soak, and an evening settled by a roaring fire. The Bolings not only got a home that causes Mark to pinch himself, but they have made friends and plan to live in a house that will last a lifetime. The media room is a perfect spot for watching a game or hosting movie night. Photo by Tim Murphy.